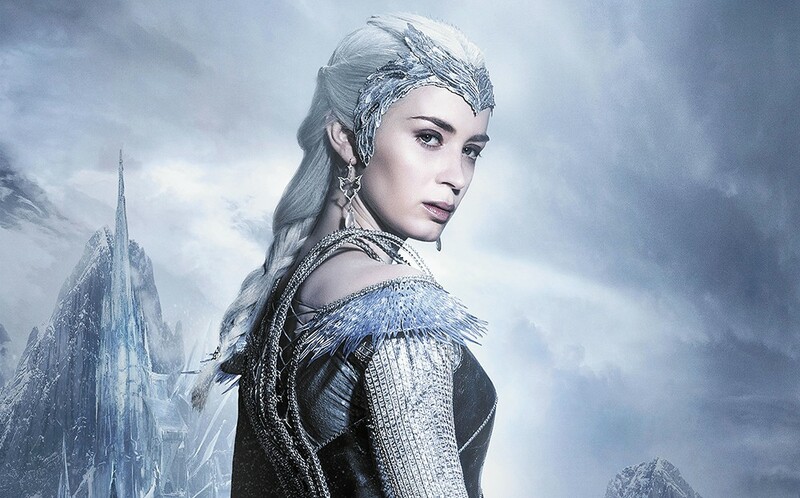 Emily Blunt plays the ice queen Freya in The Huntsman: Winter's War. It's a prequel and a sequel! It's full of girl power and reflexive lady-hating! It's a parody mashup of Lord of the Rings with Frozen and it's a longform conceptual fashion shoot! The Huntsman: Winter's War is all these things, and more, and sometimes less. It's a story about the horror of child soldiers without the horror. It's a love-conquers-all story with almost no genuine emotional content at all. It's a comedy without any actual humor. It's a movie in which, at the finale, the endlessly nonsensical narrator will sum up his word salad with "Some fairy tales do come true," and we have no idea what the hell he could be referring to. The best thing about 2012's not-very-good Snow White and the Huntsman was Charlize Theron's evil queen Ravenna. Not even her, so much as the suggestion of her backstory, which was hinted at as being rather tragic and moving and, boy, if only we knew what had made her so nasty, we might be quite sympathetic to her. So when the trailers for Huntsman informed us that we were in for "the story before Snow White," I figured that would at least involve a smidge of Ravenna's coming-of-witch. But it doesn't. Ravenna is already evil as Winter's War opens, and then she isn't much in the rest of the film anyway, except for one big showdown sequence with her sorcerous ice-queen sister Freya (Emily Blunt) that calls to mind a fancy fantasy perfume advertisement. This is mostly the tale of the Huntsman (Chris Hemsworth) and mostly it takes place after the events of Snow White... and even ultimately negates much of what we learned in that film, which will surely piss off whatever true fans the first movie has. The Huntsman gets a name here — Eric — because it turns out there are lots of Huntsmen: they are Freya's army, children stolen from the subjects in her far-northern realm and turned into warriors. Also, Freya is magic and can make things frosty just by touching them and lives in an ice castle; the cold never bothered her anyway. Eric was one of Freya's child soldiers — he turned out remarkably well adjusted for having been trained to kill from a young age and hey, wait a minute, that isn't even anywhere near what "huntsman" means. The Huntsman: Winter's War is not showing in any theaters in the area.